A gun safe protects your firearms and other valuables from being stolen or misused. However, criminals, inquisitive guests, or kids are not the only concern. Natural factors like fire and water can also cause damage to the safe and its contents. To tackle these factors, this article delves into the need of using a waterproof gun safe and the features an ideal one must have. We will also review the best waterproof gun safes available on the market, to help you in choosing the best one for your needs. 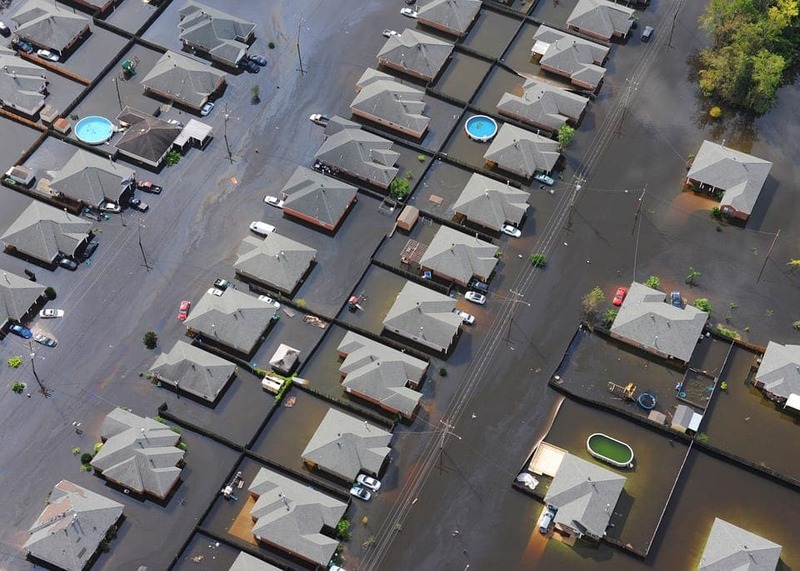 ​Hurricanes have become a very common natural phenomenon in recent years and end up causing a lot of damage due to water logging and floods. If you live in an area prone to such events, using a waterproof gun safe is your best bet to protect your valuables. It can house firearms, documents, jewelry, or even precious heirlooms. ​What most people don’t realize is that most fireproof safes are not waterproof. In the event of a fire, the first thing anybody will do is to spill water over your safe, which will seep into your safe through the dehumidifier/power cable hole. ​A gun safe must have adequate space to fit all the firearms and valuables you desire to store in it. If you are planning to increase your collection of firearms in the near future, or foresee the possibility of storing other extra items in the safe, you must go for a large waterproof gun safe. ​This factor is directly influenced by the thickness and the material of the gun safe. The most common material used to manufacture these safes is steel, and its thickness is measured in terms of gauge. The smaller the gauge, the thicker the steel. For example, a 12-gauge steel safe means it is 2.732mm thick and 0 gauge means it is 7.9375mm thick. Hence, a safe made from lower gauge steel is more durable and sturdy. ​Apart from being waterproof, a good safe must essentially be fireproof. The level of fire resistance is measured in terms of UL fire rating. The rating is basically categorized into three classes, namely Class 350 rated (protects paper products), class 150 (protects magnetic tapes), and Class 125 (protects flexible computer disks). Furthermore, safes are typically one or two-hour fire rated, which explains the amount of time for which a safe can resist a certain amount of temperature without the inside getting too hot. Waterproofing in a gun safe is not a very common feature and you will have to spend some extra money for such safes. However, it doesn’t have to burn a hole through your wallet. Additionally, the size of the safe and the value (monetary and emotional) of the contents should guide your intent to spend more or less. Based upon the aforementioned considerable factors, we will now review the best waterproof gun safes on the market. All these safes have been approved by the California Department of Justice and are the best in quality and functionality across the market. To begin with, let’s first take into consideration a small gun safe. The First Alert 2092DF is a waterproof gun safe with a storage space of 1.31 cubic feet and has a document storage sleeve, key hangers on the inside of the door, and an adjustable shelf. The safe features a backlit keypad with a glass lid on top. It can be programmed to accept a code of 3 to 8 digits with ease. The concealed hinges of the safe are pry-resistant to thwart forcible break-in attempts. The gun safe is UL fire-rated and can withstand temperatures of up to 1700 degrees Fahrenheit for an hour with the internal temperature not exceeding 350 degrees Fahrenheit. It is powered by four AA batteries and also has a couple of keys to manually open it in case of a lockout. The safe is waterproof and keeps contents inside safe in case of a flood. The First Alert 2092DF is a sturdy and heavy waterproof gun safe which can be used to store documents, cash, jewelry, and handguns. It can be easily concealed because of its size and is also affordable. The CFW20201 safe from Sentry is a compact, heavy gun safe which is exceptional for portable use. The safe has been manufactured from sturdy powder-coated steel and features a handle which can be used to carry it. The safe itself is almost the size of a laptop and is secured by a manual key lock and no electronic stuff. The gun safe is resistant to fire for up to an hour against 1700 degree Fahrenheit, which is exceptional with respect to its size. It can be used to carry important documents, jewelry, and handguns. Being waterproof and fireproof, the safe is extremely secure and versatile to use. 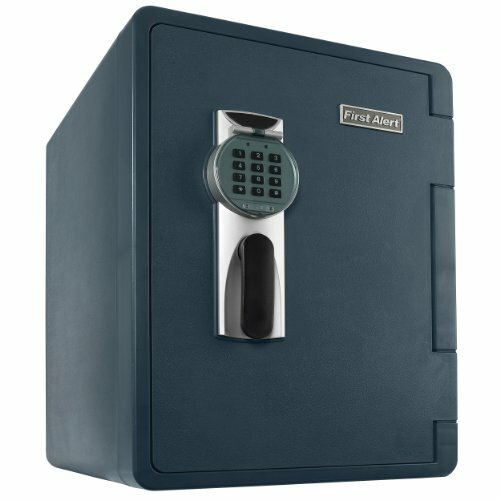 The safe is very affordable and serves its purpose really well. 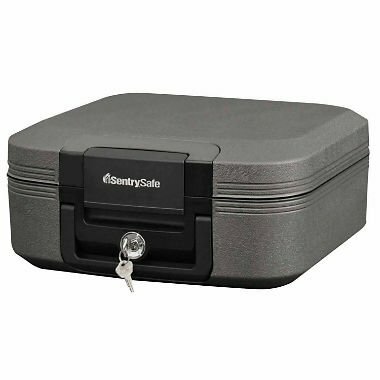 The Sentry Safe is a portable, lightweight, and compact safe which is resistant to water and fire. The safe can be used to store or transport important documents, valuables, and even handguns. It has no electronics installed which eliminates the struggles associated with batteries and tampering. 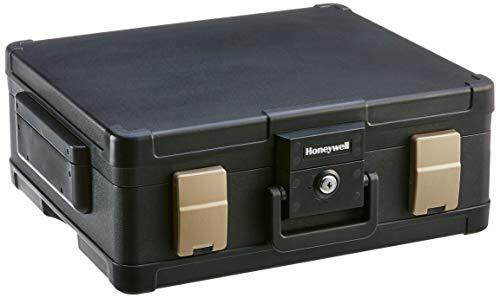 This Safe Box from Honeywell is a durable, secure, and somewhat portable measure to store your valuables. The safe has a hydraulic hinge system, which prevents the heavy lid from dropping down with a bang. The inside of the safe is well-finished and has ample space to store your documents unfolded. The box has a simple lock and key security mechanism and is fire-rated for protection against temperatures of up to 1700 degrees Fahrenheit for an hour. Additionally, the safe is water-resistant up to 100 hours and a depth of 39 inches, along with two side latches for any minor water damage. The safe can not only secure documents, but also magnetic disks, USB drives, and other media as well. The company also offers a seven-year limited warranty and a lifetime fire-warranty for this product. Looking at its price, this is a complete win-win. The Honeywell Safe Box is a technical masterpiece, considering its resistance to fire and water, as well as its design. 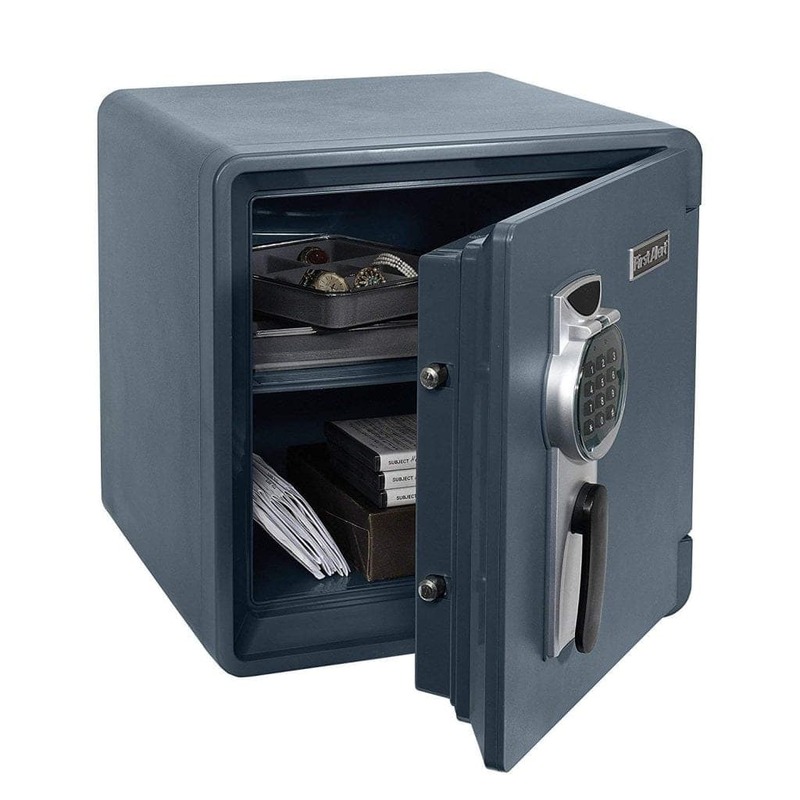 The safe is good for storing documents and other valuables at home or at the office. 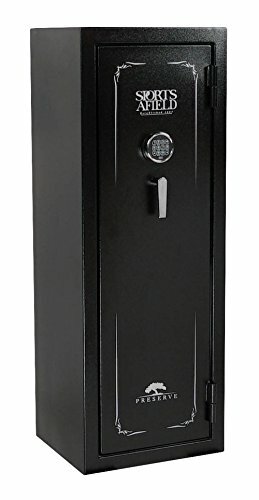 The safe has a handle for carrying, but it is too heavy for that (weighs 56 lbs). 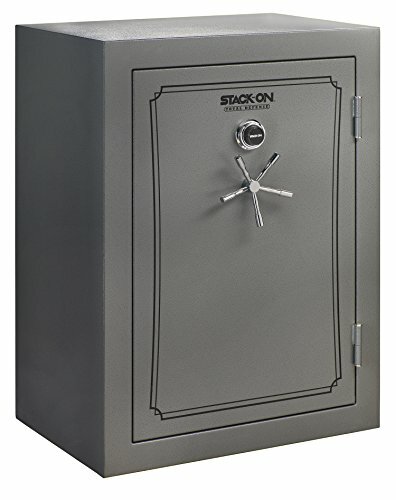 Next on our list is the huge 51-69 gun safe from Stack-On. The safe weighs a staggering 848 pounds and is made from 13-gauge, heavy-duty steel. It features a three-digit combination-based lock on the front, with drill-resistant plates inside the door. Thus, opening the safe with force is almost impossible. The interior of the safe is felt lined and has modular shelves to store guns and other items the way you like. The safe is fire-resistant for up to 75 minutes and 1400 degrees Fahrenheit and is also water-resistant in up to two feet of standing water for 72 hours when bolted down properly. The safe has a large storage capacity and is extremely secure. Additionally, the safe also has a power outlet on the inside, if you want to install a dehumidifier or any other electrical accessory. This Stack-On Gun Safe is no doubt a sturdy and durable safe with a lot of storage space. It is good if you own a number of firearms and valuables and want to keep them safe. The inner power outlet makes it easy to install a dehumidifier or lights. The only drawback is the locking mechanism, and to some extent, the price of the safe. The Sports Afield Safe is probably the best large waterproof safe in this list. Featuring a sturdy construction, the safe can resist up to two feet of water for seven days straight, hence offering you a peace of mind, even when you’re not able to retrieve the safe in a calamity. The safe is also fire-resistant and can withstand temperatures of up to 1200 degrees Fahrenheit for 40 minutes. It is secured by a programmable electronic keypad lock with a couple of bypass keys for an emergency. On the inside, the safe is fully carpeted and has a full-door organizer, along with adjustable shelves. It can accommodate up to 24 long guns and four handguns at its maximum capacity. It also includes a UL approved power outlet on the inside and four pre-drilled anchor holes on the outside. This safe is the best option for people who live in low-lying areas prone to waterlogging or floods. This gun safe is no doubt an exceptional piece of hardware with extreme resistance to water and moisture. It has a large storage capacity and the company also offers a ‘real’ lifetime warranty and free locksmith services. The difference in price is just a few dollars compared to other renowned brands, but its features and the company’s support overshadow this difference. If you want to take extra steps to keep your items dry, you can easily do so with the following. A very cheap and effective method of waterproofing guns/ammo/documents or other valuables is to store them in ziplock bags or airtight Tupperware containers and then store them in any safe. You can also use double zip locks for very important documents or sensitive items. Another very safe approach is to store a waterproof safe with your contents inside another larger gun safe. This way, your valuables will stay protected from water and will be more secure inside two gun safes. Another very intelligent method is to store a desiccant, like silica gel, in your gun safe or inside the aforementioned things (ziplock bag/container/small safe), so you can ward off even the most minor chances of dampening. A waterproof gun safe offers effective and reliable protection against natural calamities and other events which might affect your guns and valuables. Apart from being waterproof, such a safe must be durable, fire-resistant, have ample storage space, and be affordable. A waterproof and fireproof gun safe offers overall protection against every possible threat.